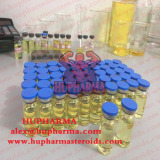 Name: Nandrolone Decanoate, Deca Durabolin, Durabol Active life: 15-16 days Drug Class: Anabolic/Androgenic Steroid (For injection) Detection Time: 18 months Common doses: 300-800mg per week Nandrolone decanoate is an injectable anabolic androgenic steroid. It is indicated for the management of the anemia of renal insufficiency and has been shown to increase hemoglobin and red cell mass. Nandrolone cannot be reduced by 5-alpha reductase into DHT and therefore does not have an adverse reaction on the prostate. Instead of DHT, nandrolone metabolizes into dihydronandrolone.